AFC Dunstable were knocked out of the Bedfordshire Senior Cup after a penalty shoot out defeat against Barton Rovers on Wednesday evening. Both sides made a number of changes to their line-ups as Barton went ahead on 26 minutes when James Bishop was caught in possession and Jevanj Brown finished well. Within a minute, Bishop made up for that and more as he rifled home from 25 yards to make it 1-1. After the break, AFC took the lead on the hour with another typical Newman Carney free kick that eluded everyone on its way into the net. Back came Barton though d when George Biggadike brought down Ben Sawyer in the box, Mahmut Caglar struck home the penalty. Again AFC took the lead when ex-Rover Jermaine Hall outpaced their defence and toe-poked the ball home on 75 minutes. 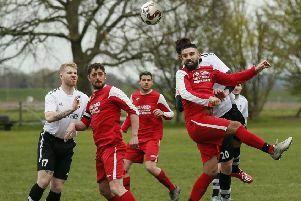 It looked like AFC had done enough, but Leon Simpson was penalised for shielding the ball by the by-line and from the set-piece, Sawyer slotted home. Rovers then took the shoot out 4-1 as AFC boss Steve Heath said: “I was so proud of the team as we matched a side that is one place off the play-offs in the Southern League and could have edged it. AFC host Stotfold this weekend as they look to make it 14 games unbeaten in the Molten Spartan SML Premier Division. Influential skipper Moses Olaleye starts the first of his four game ban for a red card at Harefield United as Head added: “Without doubt, losing Moses for four games is a massive blow, but it is the chance for someone to step up to the mark and show me they can step into his shoes. “I took so many positives out of the Barton Rovers game on Wednesday and if luck was a bit more on our side, we would be lining up in the semi-final.